Your Whippet Can Be the Dog of the Day! Make your whippet a star for a day (or longer) by entering a picture in the Dog of the Day and see your pooch in our homepage! Whippet Rescue on FB Check out our page dedicated to whippet and sighthound for adoption. Keep your eyes peeled for that special hound in distress! Share Your Whippet Adoption Stories! Share your whippet adoption story! Did you rescue a whippet in distress? Send us your whippet’s story and let other dog lovers know about best and the worst of your experience. Did you make a whippet video? Share it with the whippet lovers community and enjoy some of the best whippet videos on this page. Is your hound looking for a mating partner or a play date? Do you have a new litter of whippet puppies? Post your messages here! Share your symptoms on this page: Whippet Mania. You are not alone! Your Whippet Mix Can Be a Star Too! Your whippet cross deserves the spotlight! Send us a picture of your whippet mix and make the title of this page Whippet Mix Pictures . Saint Guinefort was a 13th-century French dog that received local veneration as a folk saint after miracles were reported at his grave. His story is a variation on the well-travelled "faithful hound" motif, similar to the Welsh story of the dog Gelert. Guinefort the greyhound belonged to a knight who lived in a castle near Lyon. One day, the knight went hunting, leaving his infant son in the care of Guinefort. When he returned, he found the nursery in chaos – the cot was overturned, the child was nowhere to be seen and Guinefort greeted his master with bloody jaws. Believing Guinefort to have devoured his son, the knight slew the dog. He then heard a child crying; he turned over the cot and found his son lying there, safe and sound, along with the body of a viper. Guinefort had killed the snake and saved the child. On realizing the mistake the family dropped the dog down a well, covered it with stones and planted trees around it, setting up a shrine for Guinefort. Guinefort became recognised by locals as a saint for the protection of infants. It was alleged by contemporary commentators that locals left their babies at the site to be healed by the dog, and sometimes the babies would be harmed or killed by the rituals involved. The local peasants hearing of the dog's noble deed and innocent death, began to visit the place and honor the dog as a martyr in quest of help for their sicknesses and other needs. 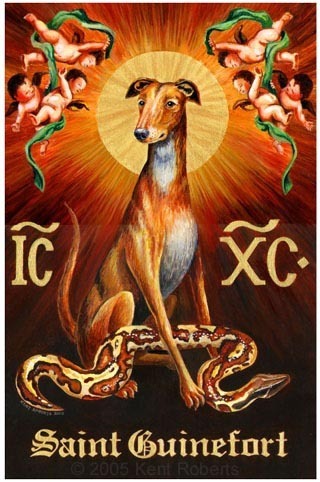 The cult of this dog saint persisted for several centuries, until the 1930s, despite the repeated prohibitions of the Catholic Church. Reverse Sneezing in Dogs: What is It and Should I Be Concerned?